The first and only vice presidential debate of the 2016 election took place Tuesday night between Mike Pence and Tim Kaine. While there were the usual differences in coverage, there was some agreement. Everyone seemed to agree that Democrat Tim Kaine put some people off with his frequent interruptions, but many thought he helped the top of the ticket more by constantly attacking the opposition. Republican Mike Pence's performance was better received, but perhaps left too many attacks on Trump unanswered. Also, our contributions to the Christian Science Monitor continue this week with The Politics of US:Muslim Refugees and National Security. Use the AllSides topics page on homeland security for background, news and dialogs, and check out our new school lesson plan for Muslim refugees and national security, our latest addition to AllSides for Schools. See other news featured by AllSides such as No “October Surprise” from WikiLeaks, VP Debate Fact Check, Hurricane Matthew Intensifies and the latest AllSides News. "But while Kaine didn’t win any points on likability, he had a job to do and he got it done: pushing out the anti-Trump talking points and highlighting the vast differences between Hillary Clinton campaign’s vision for racial justice versus the Trump campaign’s overt racism and bigotry. Kaine was irritating, but Pence was downright creepy. Many of the lies he told don’t need fact-checking to be read as such: Denying Trump’s bigotry, denying his and Trump’s praise of Vladimir Putin, pretending that it’s Clinton and not Trump who is running an “insult-driven campaign” as he put it. People who look you in the eye and lie so boldly without breaking a sweat are creepy, and I’m sure voters noticed that." 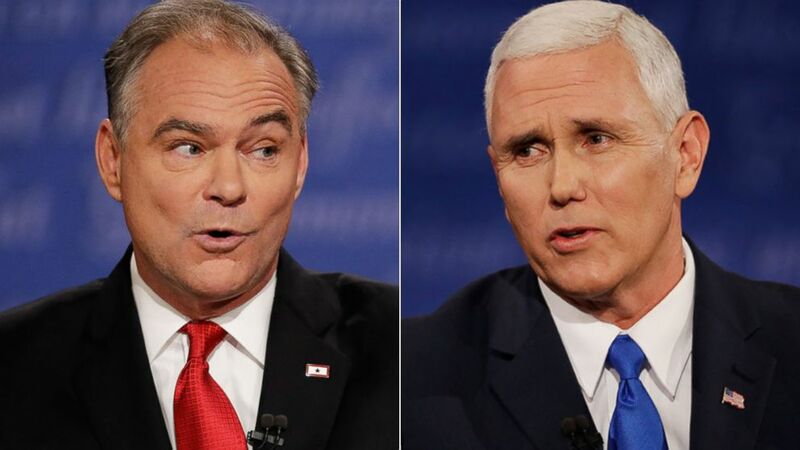 "Pence looked like a statesman; Kaine, rudely interrupting him for much of the debate, looked like a clumsy hatchet man and shameless party hack. Kaine devoted most of his energy to rattling off his opposition research, much of it too insiderish and transparently canned to impress anyone. Pence, speaking much more slowly and authoritatively, looked directly at the camera (something Kaine never did) and reiterated basic points about Hillary’s tax-and-spend policies and feckless foreign policy. That proved more effective than any point-by-point rebuttal could have. In debates, less is more, as Pence showed. Against a flailing, gabbing, demagogic opponent, it is better to step back and let the audience see that the person who talks the most often says the least. Come Sunday, Trump would do well to imitate his running mate." "The largely well-received performance by running mate Mike Pence in his matchup with Tim Kaine adds pressure to the man on the top of the ticket. In many ways, Pence provided a map for Trump, and shifted the discussion, if even for a moment, away from the worst several days of the candidate’s campaign. The vice presidential candidate’s showing lays the groundwork for Trump, who has little room for error on delivering. [S]ays GOP strategist Kevin Madden, who was a top adviser for the Mitt Romney campaign, '[Trump is] very good when it comes to connecting with large crowds and feeding off of their energy. The town hall format is more sedate. It also requires a lot of prep, and Trump has shown an aversion towards prep.'"